This report presents the outputs of the joint launch of the Enhancing National Climate Services (ENACTS) program of Meteo Rwanda and the CGIAR Research Program on Climate Change, Agriculture and Food Security (CCAFS) Rwanda Climate Services for Agriculture (RCSA) project. This launch brought together key government agencies in Rwanda, research organizations, farmers’ representatives, development partners, non-governmental organizations and media. The aim of the one day workshop was to launch the ENACTS products provided by Meteo Rwanda and to introduce the RCSA project to the government and public. This was a transition from the design phase of the project to the implementation phase. The report includes the process of the launch event, presentations made and the main comments by participants. Nsengiyumva G, Kagabo MD, Birachi E. 2016. 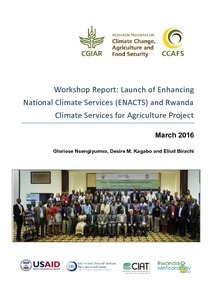 Joint launch of the Enhancing National Climate Services (ENACTS) program of Rwanda Meteorology Agency and the USAID Rwanda Climate Services for Agriculture project, Kigali, Rwanda, March 2016. CCAFS Workshop Report. Copenhagen, Denmark: CGIAR Research Program on Climate Change, Agriculture and Food Security (CCAFS).